One PlayStation 3 title just did some serious business in Japan. 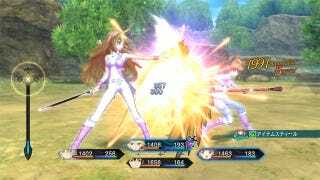 Tales of Xillia, the latest in Namco's long-running Tales of series, has already moved a half-million overseas. That's a pretty damn good start for a PS3 game. The release of Tales of Xillia did Sony a few favors on the hardware side in Japan (see below) as well, pushing the PS3 past the cheaper, now more popular Nintendo 3DS in Sony and Nintendo's home territory. It was a good week for the PS3 in general, with Resident Evil: Revival Selection—the HD upgrade of Resident Evil 4 and Resident Evil Code Veronica X—coming in second and Insomniac Games' shooter Resistance 3 coming in third. Another PlayStation 3 HD upgrad, Monster Hunter Portable 3rd HD Version, continues to sell well. Read on for the bestselling Japanese video games for the week of September 5 to 11, courtesy of sales tracker Media Create. Hardware-wise, it's advantage Sony this week, with the PlayStation 3 coming out on top. The Nintendo 3DS, however, remains strong in Japan, selling almost twice what the PlayStation Portable did in a one-week period.